Christmas 1982, aged eleven, I gave my Dad a copy of Douglas Hofstadter’s Gödel, Escher, Bach, and immediately borrowed it and read it myself. Like so many readers, I was captivated, and changed. Martin Gardner said of it: “Every few decades, an unknown author brings out a book of such depth, clarity, range, wit, beauty and originality that it is recognized at once as a major literary event.” Nothing could take its place as the biggest influence on my thought—until a quarter century later, when I started reading daily essays by Eliezer Yudkowsky on the blog Overcoming Bias. Out of those essays came a community with thousands of participants and meetups in over fifty locations worldwide. 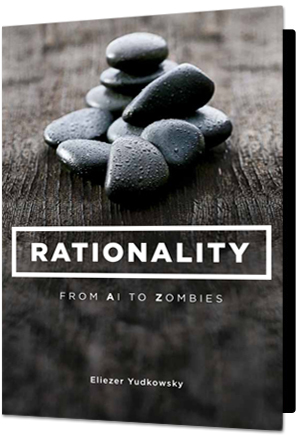 Now, they have been edited, organised, and combined with other writing by Yudkowsky and by Rob Bensinger to make this extraordinary work, Rationality: From AI to Zombies. The two bear close comparison. Both GEB and RAZ take the reader on an eclectic journey through science, art and philosophy, drawing on the tropes of Eastern philosophy as well as Western popular science. Both are borne of contemplation of artificial intelligence, but their subject is the human mind. Like GEB, each diversion in RAZ is fascinating in its own right, but each makes a real and important contribution to a central theme. Among other things RAZ discusses the mathematics of probability and decision making, the foibles of human psychology, evolution, quantum mechanics, thermodynamics, and the philosophy of reason, of mind and of morality. For both, the central theme is hard to describe briefly—in the preface to the 20th Anniversary edition of GEB Hofstadter describes his difficulties getting the New York Times to use a description that was not “utter hogwash”, while Yudkowsky can only offer that after years of study “it may be that you will glimpse the center”. Both are at times intellectually demanding. GEB is a large book; at 1800 pages organised into six books, RAZ is over twice the length, with a word count similar to The Lord of the Rings. Both are works of tremendous originality and wit. GEB is undoubtedly the greater work of beauty; while Yudkowsky is an excellent writer few if any can match the extraordinary fireworks of Hofstader’s wordplay. Conversely, RAZ surpasses it in all of clarity, range, and depth. It’s not without its flaws; it takes a while to really get started, and not all readers enjoy Yudkowsky’s Eastern nods. But RAZ also surpasses GEB in an area Gardner does not name: importance. While the nature of consciousness is a subject of endless fascination, RAZ’s drive to help us properly shift our views in response to evidence and make better decisions in the face of uncertainty given only the flawed instrument that is our brain could not be of more crucial importance. Declaration of interest: I have a spot in the acknowledgements for proofreading and very minor contributions to the new material.